*4, 5, & 6 day itineraries are also available upon request. Contact us for more details. 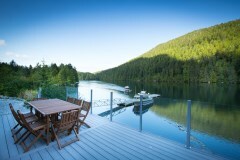 Upon arrival, you will be met by our representative and transferred on board a scheduled two hour flight to Bella Bella. Transfer from Bella Bella airport to the boat dock where a water taxi will await you and take you on a 90 minute journey to Klemty, where Spirit Bear Lodge is located. After checking in, our representatives will deliver a welcoming orientation and briefing and afterwards, the evening is at your leisure. There will be a presentation at 8pm on some the aspects of coastal ecology. After breakfast, meet on the dock at 8am for first full day bear viewing adventure to one of our main grizzly viewing estuaries! See the spectacular waterfalls in Carter Inlet. 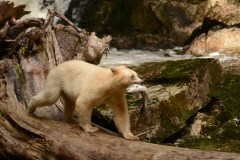 We will return at 6pm, have dinner and begin an evening presentation on the Great Bear Rainforest. 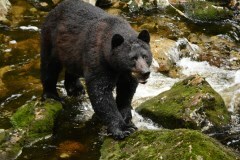 Today we will start our full day Spirit Bear viewing safari by foot in one of our Spirit Bear Rivers. Our guides have an intimate knowledge of the behavior and movement patterns of the bears and will often situate guests under the forest canopy or on a rocky outcropping to get intimate and special eye-level viewing and photographic opportunities as the bears forage for roots, berries or feast on salmon. Depending on our location we may also board small zodiacs and propel silently under oar or by small outboard motor deeper up a river or into the braided channels of an estuary to view bears. After breakfast, choose from either sea kayaking, rainforest walk or a cultural tour to complete you unforgettable stay at Spirit Bear Lodge. Afterwards, our repesentative will transfer you via water taxi to Bella Bella, in time for your flight back to Vancouver. Breakfast and bagged lunch included. 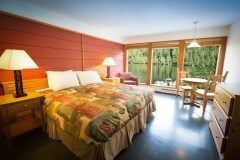 The waterfront Spirit Bear Lodge is a welcoming and comfortable place to lay your head at night after a day full of exploration and adventure in British Columbia’s Great Bear Rainforest. Each room in the Spirit Bear Lodge is afforded with a King Size bed and private bathroom and takes full advantage of the ocean and rainforest viewscapes. *Included scheduled activities may vary slightly depending on duration of the stay at Spirit Bear Lodge. For more information, please contact us.